Strategically located at a crossroads between East and West, the Bulgarian lands have been home to an amazing variety of cultures and civilizations whose traces can be seen even today. 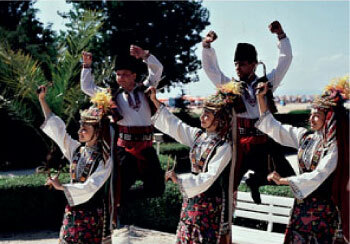 Bulgaria has a wealth of historical sites left by the different cultures that have inhabited the region throughout the centuries, such as the Thracians, Romans, Slavs, Byzantines and Ottoman Turks. Remains of the Palaeolithic and Neolithic cultures have been preserved in various parts of Bulgaria, such as Cape Kaliakra and a number of caves in Stara Planina (the Balkan Range) and the Rhodope Mountains. The culture of the ancient Thracians is richly represented by some of the most brilliant achievements in their time. The most famous are the gold and silver treasures found at Panagyurishte and Rogozen, and the tombs at Panagyurishte and Sveshtari (with unique wall paintings and decoration). The Bulgarian countryside is dotted with Thracian burial mounds, many of which are yet to be explored. Many Ancient Greek and Roman sites have been preserved, restored and opened to the public in ancient towns like Augusta Traiana (modern Stara Zagora), Trimontium (Plovdiv), Nicopolis ad Istrum (Nikopol), Pautalia (Kyustendil), Mesembria (Nessebar) and Apollonia (Sozopol), to name but a few. During the Middle Ages, the Christian Church was dominated by the Trilingual Dogma, according to which Christianity could be preached in three languages only – Hebrew, Greek and Latin. Preaching Christianity in any other language was regarded as heresy. But in the 9th century the brothers Cyril and Methodius overthrew that dogma and created the Cyrillic alphabet. This led to the creation of a lot of original works, such as saints’ lives, divine hymns, historical works, philosophical treatises, essays and chronicles of extraordinary literary value. Some of them can be seen in leading international museums, such as the Manasses Chronicle, kept at the Vatican Library, and the Tetraevangelion (The Four Gospels) of Tsar Ivan Alexander (14th century) at the British Library. 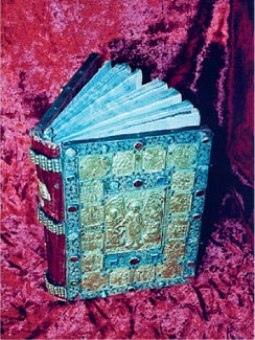 Monastery libraries played a key role in developing Bulgarian culture and preserving the Bulgarian language and identity, especially during the five centuries of Ottoman rule. Painting, music, crafts like woodcarving and goldsmithery were also practiced there. Monasteries kept the traditions and legends of ancient times, facts about holidays and everyday life, and knowledge of the world. 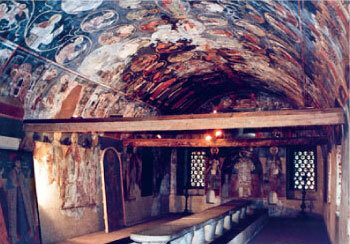 Bulgarian monasteries are true masterpieces of architecture. Looking very much like fortresses from the outside with their high walls and narrow windows, their interiors boast rows of arches, colonnades, open verandas and external staircases surrounding spacious courtyards. Their churches are richly decorated with remarkable wall paintings, splendid wood-carved iconostases and superb icons from different periods. Every monastic church is a true gallery of art. In the years of the Bulgarian Renaissance (18th- 19th centuries) special schools were founded to train icon-painters.